Before the month ends, we have introduced three new features to the OpenLearning platform! The new features will highlight our progress in improving the accessibility of the platform and enhance our existing profile page. To achieve our aim of enhancing content delivery globally, we have introduced a new Skip Links feature on OpenLearning. Skip links are internal page links that allow users to access important links and quickly navigate their way to the main content section of the page. It improves the overall navigation of the website and also helps those who rely on just their keyboard for navigation. This improvement in navigation will help users, and especially students, efficiently access the information they need to get to the most important work in their online course. On any page in OpenLearning, users can now select the ‘tab’ button and a hidden dropdown menu will appear in the upper left corner of the window. Users can use the ‘space’ (Mac) or ‘enter’ (Windows) button along with the ‘up’ and ‘down’ arrow buttons to access the menu options. To select an option, users can select ‘tab’ twice on Google Chrome web browser, and once on other browsers. Please note that each browser, and screen reader, has different requirements and experiences for keyboard navigation. We suggest that users check their devices’ settings before using the feature. On all pages, except for pages inside a course, the user will be able to skip to the Main content of the page and to the Sitemap by selecting the ‘tab’ button twice on Chrome, and once on other browsers. Main content will bring the user to the first focusable item on the page. Sitemap will bring the user to the first focusable item in the footer. Once logged in to a course, the user will have two additional options in the skip links menu: Navigation menu and My Progress. Navigation menu brings the user to the first item in the side navigation bar. Often, but not always, this is the Homepage. My Progress brings the user to their progress bar. We have a new section to keep you up-to-date about significant platform changes happening on the platform! When information about an update becomes available, you will see the “What’s New” icon (a gift box icon) on the top bar. If there are no new updates, the icon will be hidden from the top bar but you can still access the “What’s New” section from your profile menu. 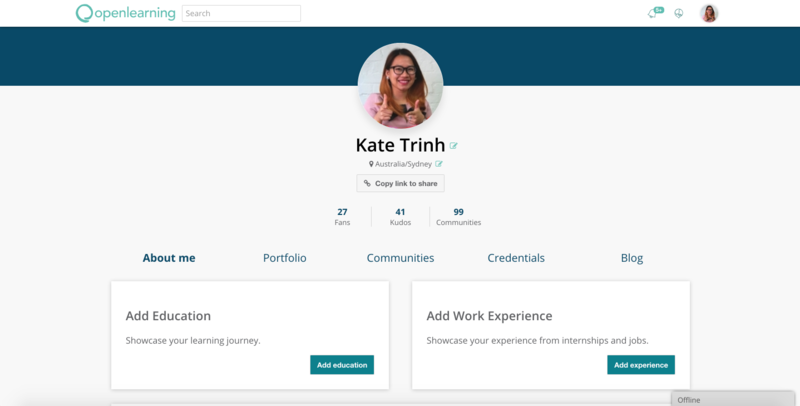 In addition to the portfolio that instantly collects students’ coursework and achievements that was added to the profile page, students can now showcase information related to their education and work experiences! This feature will allow students to give prospective employers a holistic view of what they have achieved. Prospective employers will get a true picture of candidates through evidences of their capabilities, interests and both technical and soft skills. To start adding content, simply go to your Profile page by clicking your avatar at the top right corner of the page. Proceed to your About Me section and click ‘Add education’ or ‘Add experience’. You will have the options to fill in the name of your school and the place that you are currently or have been working with, include their logo, add your field of study with a short description, and so much more. Once added, your profile page will have an additional section located below your About Me blurb to display your education and work experiences. We are hoping that our new feature can better facilitate content delivery and offer a new way for students to be discovered based on their true capabilities. Like our new features? Or are you facing some technical troubles? Share your thoughts in the OpenLearning Help Community!